This publication provides you with tips to prevent foodborne illness, beginning with the trip to the supermarket and ending with the proper temperatures the food should be cooked. Prevention of foodborne illness starts with your trip to the supermarket. Pick up your packaged and canned foods first. Don’t buy food in cans that are bulging or dented or jars that are cracked or have loose or bulging lids. Look for expiration dates on the labels and never buy outdated food. Likewise, check the “use by” or “sell by” dates on dairy products, such as cottage cheese, cream cheese, yogurt and sour cream, and pick the ones that will stay fresh longest in your refrigerator. Choose eggs that are refrigerated in the store. Before putting them in your cart, open the carton to make sure none are cracked or leaking. Save frozen foods and perishables such as meat, poultry or fish until last. Always put these products in separate plastic bags so that drippings don’t contaminate other foods in your shopping cart. Check for cleanliness at the meat or fish counter and the salad bar. For instance, cooked shrimp lying on the same bed of ice as raw fish could be contaminated. When buying from a salad bar, avoid fruits and vegetables that look brownish, slimy or dried out. These are signs that the product has been held at an improper temperature. When shopping for shellfish, buy from markets that get their supplies from state-approved sources; stay clear of vendors who sell shellfish from roadside stands or the back of a truck. And if you’re planning to harvest your own shellfish, heed posted warnings about the safety of the water. Take an ice chest along to keep frozen and perishable foods cold if getting your groceries home will take more than two hours. Wash hands with warm water and soap for at least 20 seconds before and after handling food, especially fresh, whole fruits and vegetables, and raw meat, poultry and fish. Clean under fingernails, too. Rinse raw products in warm water. Don’t use soap or other detergents. If necessary and appropriate, use a small scrub brush to remove surface dirt. Use smooth, durable and nonabsorbent cutting boards that can be cleaned and sanitized easily. Wash cutting boards with hot water, soap and a scrub brush to remove food particles. Then sanitize the boards by putting them through the automatic dishwasher or rinsing them in a solution of 1 teaspoon of chlorine bleach to 1 quart of water. Always wash boards and knives after cutting raw meat, poultry or seafood and before cutting another food to prevent cross-contamination. Store cut, peeled and broken-apart fruits and vegetables (such as melon balls) at or below 41 F in the refrigerator. Apply the Heat and Fight BAC! Cooking food to the proper temperature kills harmful bacteria. 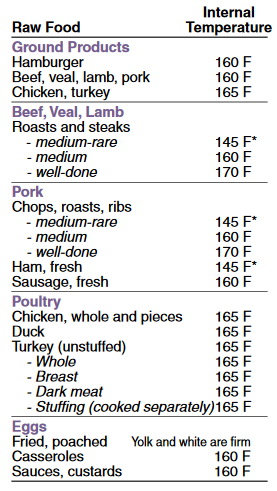 This includes raw meat, poultry, fish and eggs, as well as foods that are thoroughly cooked upon purchase. Precooked foods may become contaminated during storage or handling. Reheat ready-to-eat foods, such as hot dogs, luncheon meats, cold cuts, fermented and dry sausage, and other deli-style meat and poultry products, until they are steaming hot. If you cannot reheat these foods, do not eat them. This chart has been adapted for home use and is consistent with consumer guidelines from the U.S. Department of Agriculture and U.S. Food and Drug Administration (FDA). For more information about food safety, visit the NDSU Extension Service Web site.